I was doubly humbled and honored to receive the Premio Meme award this month from Jennie The Bead Doodler and Emma of Glitter Glow Beading. We beaders and jewelry designers are such a generous and tight-knit group. It seems that no matter where we’re from, or what we create, we always find a way to compliment and encourage each other. The rules are simple. List seven facts about yourself and pass the award to seven worthy bloggers. I thought it would be fun to use some of my favorite Inspired Beader questions and do an autobiographical interview. 1. How did you first discover beading? When I was younger, my mother filled up her free time with different crafty and creative hobbies. Every year or so she would find something new, such as stained glass or doll making. When she gave up doing Native American style leatherworking and bead embroidery, I inherited her entire stash. I only made a few seed bead strung necklaces and bracelets, but something inside of me had clicked. 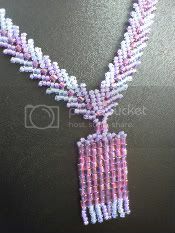 Since then, I have always gravitated towards crafts with beads, until one day I discovered bead weaving. I picked up a beading calendar just for fun, and I’ve been completely hooked ever since. 2. What is your favorite source for ideas or techniques? I really love to see what other artists are doing. I’m always watching the newsstand for the latest issue of my favorite beading magazines, and I try to visit blogs and forums whenever I’m not totally swamped. When I see an amazing project with a stitch, color or material I haven’t used in awhile, or that is new to me, I think about how to adapt it to my own style. 3. Do you have a favorite type of bead? I have always been completely crazy about color-lined crystal 11/o seed beads. There’s something about their shine that really captures everything I love about beads. A few years ago I also discovered tinted color-lined seed beads, and found that there are endless possibilities for color and beauty with these little treasures. I think my all time favorite is black-lined red. 4. What is your favorite bead color combination? I love to match black with green and/or coppery browns. I think the combination looks so elegant and regal. If I have an idea for a piece of jewelry that doesn’t require a special color palette to come together, chances are it will be black and green. 5. Where do you find the most inspiration? 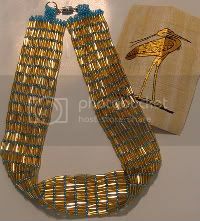 I used to be obsessed with Ancient Egypt, and did a lot of beadwork in typical Egyptian color schemes and patterns. Now I find myself doing a lot of ocean-themed pieces. Living on the West Coast makes finding inspiration easy - there’s aquatic life and art everywhere. 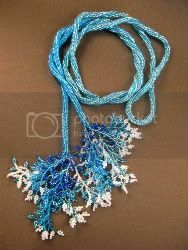 Not only are there so many gorgeous and wonderful sea creatures to imitate, it’s really easy to express the ideas and themes with beads. Even abstract work can easily be recognized for it’s aquatic undertones. 6. What is your favorite technique? Whenever I’m inspired by color, the first thing I think of doing is spiral rope. I love it’s simplicity, and how easy it is to embellish, adapt, connect and stitch. If peyote stitch is a beader’s bread and butter, spiral rope is like salt and pepper - it goes with everything. 7. Who do you hope to inspire with your work? I’ve made it my mission in life to help change the way people think about jewelry. The amount of value that is placed on gold and diamonds - with little thought to how they make it to our jewelry boxes - doesn’t exactly fit in with 21st century thinking. I hope that by making, wearing and selling handmade glass jewelry, that I can help to inspire more eco-friendly fashion trends. 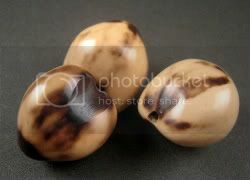 I recently ordered some interesting heart-shaped nut beads on sale. I wasn’t sure at the time what I was going to do with them, but I was determined to try them out. When I opened the package and saw the beads in person, all I could think of was fringe. I let the idea of adding fringe to the nut beads marinate for awhile. Eventually, I decided that they would be great as the focal points at either end of a lariat necklace. For the base of the necklace, I wanted something that was simple and organic, to go with the natural quality of the heart-shaped nuts. The most obvious color choice for a nature theme is green, so I chose a transparent green mixture. I like the way the colors blend together, creating a natural-looking texture. I also grabbed some olive green 8/o’s, and some glass teardrops in turquoise Picasso and smoked topaz luster. I really love the contrast of orange against green, so I also selected some foil-lined orange 6/o seed beads as accents. They fit in nicely with the greens and browns, perhaps mimicking orchids or leaves. With the summer heat getting ever more intense, it seems appropriate to make something that looks right at home in a sweltering jungle. For a simple, light necklace, I used spiral rope with the 8/o seed beads at the core. 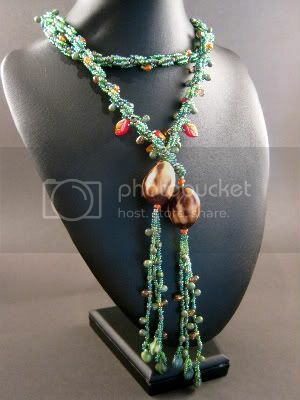 The green 11/o’s create a swirling vine, with orange and olive beads throughout. Towards the ends of the rope, I began adding the drops. I also decided to add some pretty red and brown glass leaves. 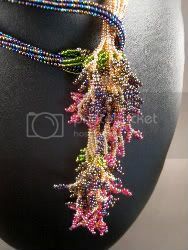 The fringe beneath each nut bead is made up of seed beads and drops, with green and black spade-shaped drops at each end. The necklace feels very light and playful, even though it was inspired by a hot, humid rainforest. Last Christmas, I attempted my very first embroidered bezels. I had always admired the perfectly jacketed cabochons I had seen in magazines, but until then, I hadn't been brave enough to attempt one. The green, black and silver bracelet turned out quite nice, and helped inspire more confidence in my peyote stitch abilities. For me, it's proof that practice really does make (almost) perfect. What seems impossible one day can be easy another day, with a little practice. With a fresh selection of 11/o and 15/o seed beads in my stash, I decided to take the plunge and try a plain peyote stitch bezel. With no fabric to steady my work against, I was a little nervous about how it might turn out, but you never know until you try. I wanted to experiment with inexpensive cabochons first, so I grabbed some pretty glass nuggets from the home decor section of my local craft store. After much searching and sorting, I was able to select a few that were nearly perfect circles. To match the blue-black cabs, I picked some dichroic-lined cornflower blue 11/o's, and purple lined sapphire 15/o's. The first beaded cabochon worked out so nicely, that I just kept going made 2 more. 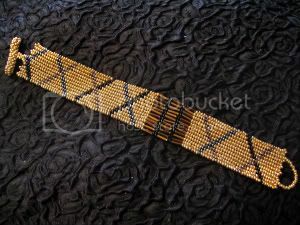 Once they were completed, I connected each one with a small strip of right angle weave, and added a bail. Thanks to this very successful experiment, I find myself wandering around, looking at everything and thinking to myself "Can I bezel that?!" 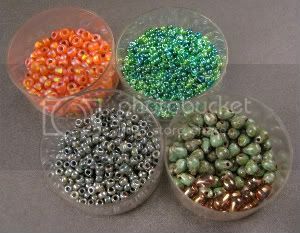 Many beading books and resources tell us that it’s a good idea to create swatches of seed beads, to help with color selection. If you have a small piece of beadwork representing every color and finish in your stash, it’s easy to select just the right beads for every palette or project. 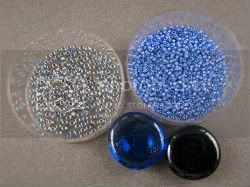 It’s a great idea, but if you’ve already got a large selection of beads on hand, it can seem like a pretty daunting task. Who wants to spend all that time making little square stitch samples when there’s jewelry to be made? Being able to mix and match colors easily is a great way to experiment with color possibilities though. 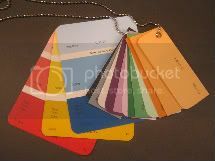 To solve part of the dilemma for myself, I dropped by my neighborhood paint store and picked up a selection of paint swatches in all the basic colors. After cutting the cards into separate colored slips, it’s easy to create new and interesting palettes based on themes, moods or even memories. After playing with different colors, it’s just as easy to select beads that match, and make a stunning or intriguing piece of beadwork. Try it yourself, and have a little fun with color! A recent post from the Etsy Success newsletter discussed the importance of having a balance of selection in a shop. Too many choices can make a customer less likely to find something that they like. The same is true for our bead stashes. Have you ever been in the mood to create something, but had absolutely no idea which beads to combine for just the right colors or textures? Whenever I’ve been stumped by the endless color possibilities that comes with being a seed bead hoarder, I do a little photo editing. If I already know what sort of design I want, I’ll grab a photo of a similar project, and experiment with different colors using the Fotoflexer on Photobucket. 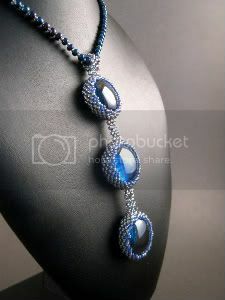 By adjusting the hue values in any given photograph, you can drastically change the appearance of a piece of beadwork. It’s even more fun when the original picture contains contrasting or distinctly different colors. Often times, the results of sliding the hue tab is an instant inspiration - the colors come out great and I want to create a piece with the new palette. Other times, the results are a good example for a color scheme, as with the green and orange combination. The contrast is interesting, but some subtle changes in the actual bead colors would look much more elegant. 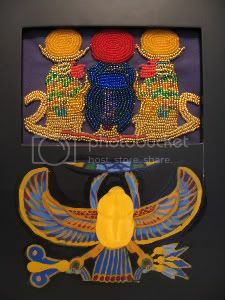 It’s also fun to see what a piece of beadwork would have looked like with a different selection of beads and colors.